In 2007 Peter Lu published an article upon 5-folded symmetries in Medieval Islamic tesselations. 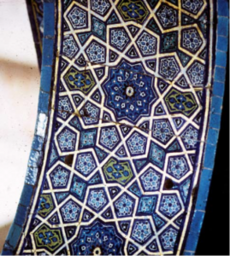 And more, he suggested that the tiles weren't concieved using straight edge and compass but constructed upon an underlying pattern of so called "girih" tiles. Discover the tiles and the way they were used to build not-regular tesselations.